You can buy Cuban money at the Cadeca in major hotels. It is known as the Convertible Peso... or CUC. You will need your passport when buying CUCs. Make sure your Canadian dollars or euros have no rips or tears, as they will be refused. 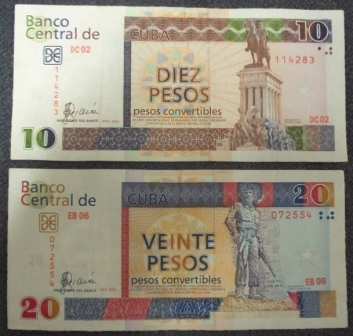 The Convertible Peso--or CUC--is the currency that is accepted everywhere in Cuba. The CUC is pronounced "kook" by the locals. It is also referred to as "chavitos." There is a kiosk to change money outside the front doors of Jose Marti Airport. Always check your receipt and then count your bills in front of the cashier as they sometimes take advantage of the "rush" at this particular exchange. 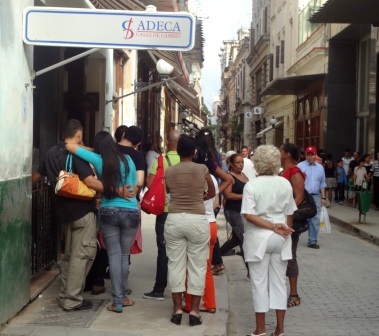 Once in Havana you will want to look for a Cadeca (short for Casa de Cambio) when you need to exchange your Dollars or Euros into CUCs. There are ATMs at many banks in Havana where you can get CUCs with your Visa credit card. You will need a bank teller to get your CUCs with MasterCard. TIP: If you see the message Transaction Denied do not worry. Just reinsert your card and try a different amount. Sometimes there are only 20 CUC bills available... so enter an amount you can divide by 20. If you still have no success just try another machine. If not successful just enter the bank and ask a teller for help. People should contact their bank before traveling to ensure that their card will be supported there. The CUC is the money that you use anywhere in Cuba if you want to make a purchase in the Dollar shops, boutiques or for tourist activities.